The Kill-A-Watt is a plug-in tester that provides accurate, detailed information about not only energy consumption in watts or VA but also the voltage, line frequency, power factor. 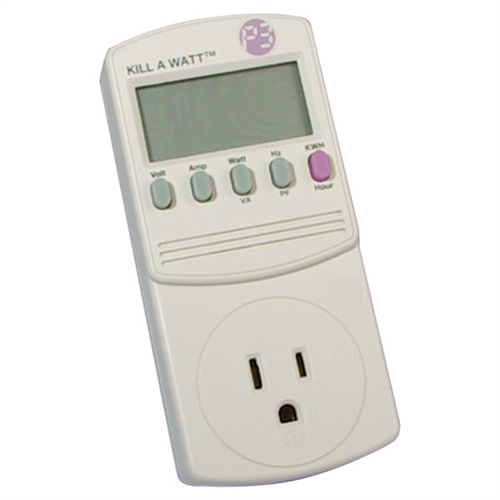 The Kill-A-Watt is perfect for testing all your electrical outlets as well as finding the energy consumption of all the plug-in devices in your home. You can use it to find energy hogs, phantom energy use and it's a great device to take shopping to measure the energy draw of major appliances before you purchase them. Dimensions: 5.125" x 1.625" x 2.375"